A perfect life, in which the goal of yoga is reached, Srila Prabhupada explains, is dynamic and full of activity. Our nature is spiritual, and spirit is the essence of everything that lives. Real yoga means to connect our activities with the Supreme Spirit—in straightforward, practical ways. If perfection is possible, why settle for anything less? This flux is the nature of the material world. “Again and again the day comes, and this host of beings is active; and again the night falls, O Partha, and they are helplessly dissolved.” (Bg. 8.19) Although we do not want devastation, devastation is inevitable. At night, everything is flooded, and when day appears, gradually the waters disappear. For instance, on this one planet, the surface is three-fourths covered with water. Gradually, land is emerging, and the day will come when there will no longer be water but simply land. That is nature’s process. We cannot calculate the length and breadth of this universe. There are millions and millions of universes like this within this material world, and above this material world is the spiritual sky, where the planets are all eternal. Life on those planets is also eternal. This material manifestation comprises only one fourth of the entire creation. Ekamshena sthito jagat [Bg. 10.42]. Ekamshena means “one fourth.” Three fourths of the creation is beyond this material sky, which is covered like a ball. This covering extends millions and millions of miles, and only after penetrating that covering can one enter the spiritual sky. That is open sky, eternal sky. In this verse it is stated, paras tasmat tu bhavo ’nyah: [Bg. 8.20] “Yet there is another nature.” The word bhava means another “nature.” We have experience only with this material nature, but from Bhagavad-gita we understand that there is a spiritual nature that is transcendental and eternal. We actually belong to that spiritual nature, because we are spirit, but presently we are covered by this material body, and therefore we are a combination of the material and spiritual. Just as we can understand that we are a combination of both natures, we should understand also that there is a spiritual world beyond this material universe. Spiritual nature is called superior, and material nature is called inferior, because without spirit, matter cannot move. The word vyakta means “manifest.” This material universe that we are seeing (or partially seeing) before us is manifest. At least at night we can see that stars are twinkling and that there are innumerable planets. But beyond this vyakta is another nature, called avyakta, which is unmanifest. That is the spiritual nature, which is sanatana, eternal. This material nature has a beginning and an end, but that spiritual nature has neither beginning nor end. This material sky is within the covering of the mahat-tattva, matter. This matter is like a cloud. When there is a storm, it appears that the entire sky is covered with clouds, but actually only an insignificant part of the sky is covered. Because we are very minute, if just a few hundred miles are covered, it appears that the entire sky is covered. As soon as a wind comes and blows the clouds away, we can see the sky once again. Like the clouds, this mahat-tattva covering has a beginning and an end. Similarly, the material body, being a part of material nature, has a beginning and an end. The body is born, grows, stays for some time, leaves some by-products, dwindles, and then vanishes. Whatever material manifestation we see undergoes these six basic transformations. Whatever exists within material nature will ultimately be vanquished. But herein Krishna is telling us that beyond this vanishing, cloudlike material nature, there is a superior nature, which is sanatana, eternal. Yah sa sarveshu bhuteshu nashyatsu na vinashyati. When this material manifestation is annihilated, that spiritual sky remains. This is called avyakto ’vyaktat. In the Second Canto of Srimad-Bhagavatam, we find a description of the spiritual sky and the people who live there. Its nature and features are also discussed. From this Second Canto we understand that there are spiritual airplanes in the spiritual sky, and that the living entities there—who are all liberated—travel like lightning on those planes throughout the spiritual sky. This material world is simply an imitation; whatever we see here is simply a shadow of what exists there. The material world is like a cinema, wherein we see but an imitation or a shadow of the real thing that is existing. This material world is only a shadow. As stated in Srimad-Bhagavatam (1.1.1), yatra tri-sargo ’mrisha: “This illusory material world is a combination of matter.” In store windows we often see mannequins, but no sane man thinks that these mannequins are real. He can see that they are imitations. Similarly, whatever we see here may be beautiful, just as a mannequin may be beautiful, but it is simply an imitation of the real beauty found in the spiritual world. As Sridhara Svami says, yat satyataya mithya-sargo ’pi satyavat pratiyate: the spiritual world is real, and this unreal material manifestation only appears to be real. We must understand that reality will never be vanquished and that in essence reality means eternality. Therefore material pleasure, which is temporary, is not actual; real pleasure exists in Krishna. Consequently, those who are after the reality don’t participate in this shadow pleasure. The path of perfection consists of a historic series of talks—elaborations on a previously published commentary—by His Divine Grace A.C. Bhaktivedanta Swami Prabhupada [1896–1977] on India’s greatest spiritual classic, the Bhagavad-gita. In these absorbing talks, Srila Prabhupada explores deeply the philosophy of yoga as explained in the Sixth and Eighth Chapters of the Gita, showing clearly how these timeless teachings apply to twentieth century mankind. Srila Prabhupada’s talks probe questions concerning the nature of consciousness, techniques of meditation, karma, death, reincarnation, and even spiritual ecstasy. The Bhagavad-gita, described by one contemporary psychologist as “a remarkable psychotherapeutic session,” appears to us in the form of an extraordinary dialogue between Lord Krishna, the Supreme Personality of Godhead, and His warrior disciple Arjuna. Perplexed and confused about his identity and purpose, Arjuna turns to Krishna, who reveals “the path of perfection” to His able student. The essence of Lord Krishna’s teachings is that one must become a yogi, that is, one whose life is centered on the practice of yoga. And what is yoga? The Sanskrit word yoga literally means “union,” and refers to the union, in love, between the individual consciousness and the Supreme Consciousness, the self and the Superself, the soul and God. Yoga is, indeed, “the path of perfection,” because it aims toward this most exalted human attainment. 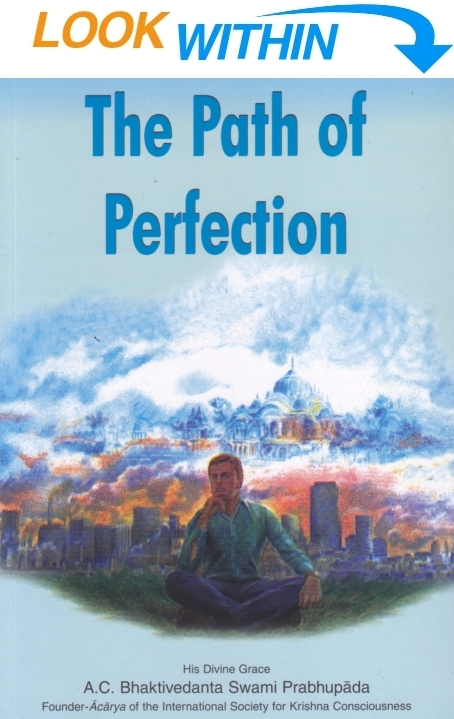 The Path of Perfection, by His Divine Grace A. C. Bhaktivedanta Swami Prabhupada, explains the highest standard for human beings, the practice of the science of self-realization, bhakti-yoga. A chronicle of an historic series of talks by Srila Prabhupada, who has been acclaimed by scholars as the greatest exponent of the Indian spiritual tradition, this book deeply probes the nature of consciousness, meditation, karma, death, and reincarnation. He prescribes a simple process to purify the mind and elevate the consciousness—a process that assures readers not only inner peace but the power to change the chaotic trend of modern society.